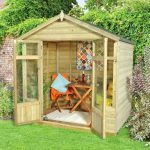 The Hartwood 12′ x 9′ FSC Winchcombe Pavillion is not only one of the largest pavillions on the market it is also one of the largest outdoor structures that you can add to your garden. This is just an incredible looking pavillion that offers you an amazing amount of room to make use of. You are going to be able to have many friends and family members in here with you as you enjoy some good food, good music and of course plenty of good times. This is a very charming structure with a fully cladded back, lattice sides and a balustrade fence like area at the front. As a bonus, five high quality, flat packed wooden benches will be included so you can have a large seating area if you want. Those who purchase this pavillion are at first going to be impressed by its good looks, but it will be the incredible quality that really impresses them. 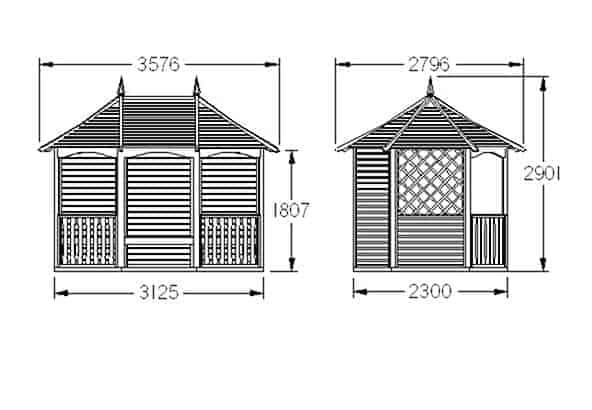 Made with strong timber this is one very robust pavillion and with its strong frame it has a very sturdy and high quality feel to it. The floor is able to handle a lot of weight as it is made from high quality tongue and groove boarding which is also used for that gorgeous roof. Wow is what most people, us included when they see the Hartwood 12′ x 9′ FSC Winchcombe Pavillion for the first time. This is just incredible in every way and it offers you a very fun place to relax, throw a party, or just have a nice meal outdoors with a few good friends. This will require a large garden to be installed in as it is a phenomenal 11 feet 9 inches wide. The depth is 9 feet 11 inches so as you can see this takes up some serious real estate in your garden. We are not putting the pavillion down for this at all as it is the size that makes it so impressive and special. 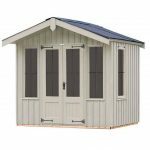 It offers plenty of headroom with eaves height being 5 feet 11 inches and the ridge height an amazing 9 feet 11 inches. The roof looks fantastic it is a very smart design and as it has a high ridge rain is always going to just run right off it. 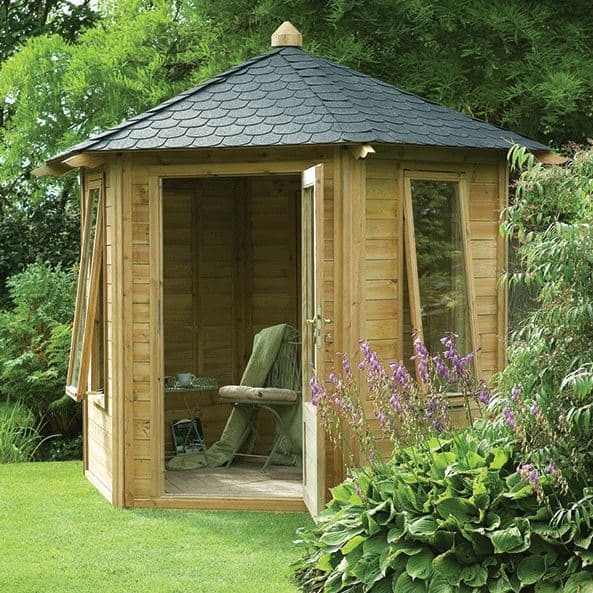 Made with high quality tongue and groove boarding this is one very strong roof that also has a very striking look to it that we just love. The roof has some very cool looking framing on it along with a very attractive little decoration right on the top that just finish it off nicely. On the back of the pavillion are three solid back panels that are made with tongue and groove cladding. This actually offers quite a bit of protection from the elements and it also looks great as well. On the front of the pavillion are two smart looking balustrade sections and on the side we have sections that would be just perfect for hanging or climbing plants. To ensure that this is one very strong structure that can handle wild parties, kids messing around and you drunkenly walking into it after one too many, 45 mm x 45 mm framing is used. This is some of the strongest kind of framing that you can get and we are just blown away at how impressive it is. We know that 45 mm x 45 mm makes it sound like the frame is going to be sticking out and getting in the way, but this is not the case at all. The flooring looks great and it is made with tongue and groove boarding. We really like the smooth look of this flooring and we are sure sitting on here on a nice summers day will be fun. The floor is thick and strong so you will be able to really fill this up with things or even just a load of people if you want to throw some kind of shindig. 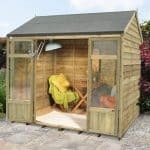 The Hartwood 12′ x 9′ FSC Winchcombe Pavillion will need to be treated on an annual basis if you really want to make sure that it keeps its good looks and ages gracefully like Harrison Ford and does not resemble someone like Mickey Rourke in his later years. Treating the pavillion should be done soon after installation, you do this and you will have no problems with rot. We love how they give you a 15 year anti rot guarantee with this as it shows that they have a lot of faith in their product. This is a great guarantee, but it is only valid as long as you maintain the pavillion properly. Inside the pavillion you have a phenomenal amount of room to make use of. You could have no seating or anything in here and just use it as a fun place to stand around with some friends while you have a few beers or a glass of wine. But if you do want to have a seating area then you will be pleased to know that included with this is a set of five high quality and good looking, wood benches. These will come flat packed and will be easy to install. We know that when it comes to things like gazebos, arbours and of course pavillions that stability is something that more than a few of you are a little concerned with. We know that no one wants to wake up, go outside and then have to flip over their pavillion that has blown over. This is so large and heavy that you will not have to worry about any kind of issues with it, even in the wildest and nastiest wind, this pavillion will not be going anywhere. There are no customisation options with this pavillion, well there is those five benches that you may or may not decide to use. Apart from this any customisation will be down to you, you can have a lot of fun with this making use of the lattice sides and the vast space it offers you. You do not have to worry about being hustled or harassed into purchasing extras that you do not really need, as there are no extras available with this pavillion. We will tell you right now that this is one of the most high quality pavillions we have seen, but it still will not prepare you for how amazing this is. The quality is just incredible from the strong floor to the peak of that high roof. As long as you look after this properly, we do not see you having any kind of issues with the materials. You are looking at well over 20 years of use with this. This is one of the largest outdoor structures that you can get. This is just insanely huge, but with all this space comes the need for a large garden to install it. 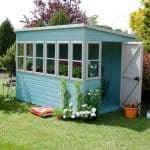 We know that the size of this may make some of you a little nervous about installing it, but to be honest with you this is no harder or fiddly than installing something like a shed. Just make sure you have a person to help you out and you will have no trouble at all. 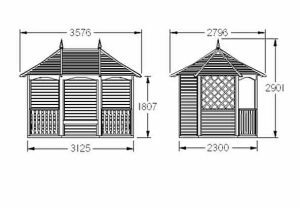 While we really like the design and the size of the pavillion there is no denying that is going to cost you a vast amount of money. But we are happy to say that those who are willing to pay the asking price will be very pleased with this and feel they got excellent value for money. 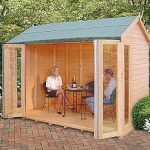 Final Thoughts: When we first heard about the Hartwood 12' x 9' FSC Winchcombe Pavillion, we really did not know what to expect. We had never seen a pavillion of this size so we were a little unsure. Well after a while we came to the conclusion that while this may be one of the most expensive outdoor garden structures we have seen, this is one of the most impressive and well designed pavillions that money can buy. The size is so large that this can be used for many different things and the materials used are just top of the line in every regard. 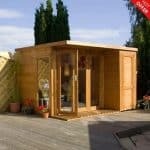 If you want a pavillion of the highest quality then you do not get much more high quality than this.